From right) Shoshone seniors Patti Fitzgerald, Cierra Hennings, Bailee Owens, Ari Regalado and Rionna Kerner have their photo taken Monday, Feb. 11, 2019, at Shoshone High School. 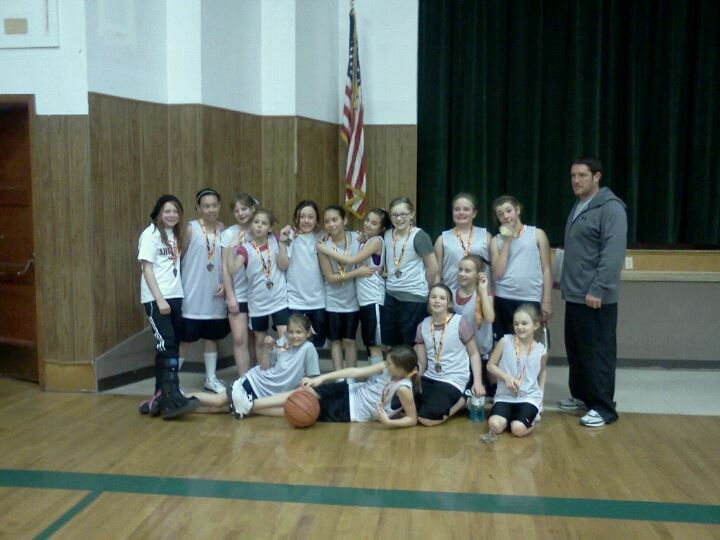 Bailee Owens (back, 1st from right), Patti Fitzgerald (back, 2nd from right), Cierra Hennings (back, 4th from right), Ari Regalado (back, 5th from right) and Rionna Kerner (front, 2nd from left) pose for a fifth-grade team photo on Feb. 25, 2012. Shoshone's Patti Fitzgerald (10) and Cierra Hennings (22) double-teams Wendell's Aspen Stinemates during non-conference play Thursday night, Dec. 20, 2018, at Shoshone High school. Valley's Makenna Kohtz (20) goes up for a rebound against Shoshone's Ari Regalado (32) and Rionna Kerner (23) during their game Monday night, Feb. 4, 2019, at CSI in Twin Falls. Valley's Broganne Mangum (right) fights for the ball with Shoshone's Bailee Owens during their game Monday night, Feb. 4, 2019, at CSI in Twin Falls. Nine years ago, they were split up into separate teams with different colored shirts, chasing basketballs around the school cafeteria in Shoshone. Patti Fitzgerald recalls once running into the cafeteria wall trying to save a ball from going out of bounds. Cierra Hennings said they would basically take each other out on the floor. “We were trying to beat the crap out of each other,” Bailee Owens said. That lasted for two years, before of Owens, Hennings and Fitzgerald, along with Rionna Kerner and Ari Regalado, all joined forces on the same team in fifth grade. Now, all five of those players are seniors on the Shoshone High School basketball team, and they comprise the Indians’ starting five. They’ve played with each other a long time and have known one another even longer. They’ve never won fewer than 17 games in a season since their freshman year. This season, they helped their head coach, Tim Chapman, earn his 500th career victory during his 28 years at Shoshone. At the state tournament this coming weekend, there’s one final chance for those girls to come full circle on what they started years ago, with a competitiveness that never quite went away. What started as a bit of a rivalry in the cafeteria blossomed into a budding friendship. They were close, Regalado said, but if one’s team beat the other’s, you could guarantee the loser would be a little upset after the game. But, in fifth grade, when the group began to play together, things clicked immediately. That first team they played for as fifth graders was coached by Tony Owens, Bailee’s dad and Chapman’s nephew. Chapman said he coached Tony Owens, both as a football player and junior varsity boys basketball player before taking over the girls hoops job at Shoshone, but Owens said he hadn’t considered becoming a coach himself until that fifth grade team needed someone. When it came to how he was going to approach it, there wasn’t going to be much intricacy involved. Fitzgerald echoed Regalado’s sentiment, saying that, when they started to win tournaments as a team in those early years together, there was sort of a realization that the core group of girls could be really successful. Along with the fundamentals, Owens’ goal was to instill the never-ending drive to improve in his team. With support from parents and community members, he said, they were able to raise enough money to start an Idaho prep team and start expanding from their schedule against smaller, local teams, and go head-to-head with squads from the Treasure Valley, and even Utah. One local team they continued to go up against was Gooding. Tony Owens said they’d play Gooding practically every weekend, and it was almost a guaranteed loss. So, when the girls saw Gooding on the upcoming schedule, they’d complain, and Tony Owens always had a response. Tony Owens started with a team of 16 fifth graders. That crowd slowly whittled down to the five seniors that go out on the floor for the opening tip for Chapman’s team today. All the while, Chapman was confident they’d be ready to make the step up when the time came. After beginning to play together, and do so under Tony Owens, the girls continued to grow on the court. While the AAU ball continued, Shoshone’s middle school team, under coach Mark Sant, went undefeated when the current group of seniors was in seventh and eighth grade. When they entered their freshman year, Hennings and Owens were brought up to the varsity level right away, and started. The difference between the previous levels they’d played at and operating under Chapman instantly became apparent to them. Tony Owens said he knew they could make the adjustment to the heightened level of play, mainly because they’d already done it once when they began to play those tougher teams as younger kids. After the varsity team won two games while those girls were in eighth grade, Owens and Hennings helped the Indians to a 17-win season. While those two began their varsity careers, Regalado, Fitzgerald and Kerner had to spend some time apart from their close friends and longtime teammates. Chapman felt it was a good experience for that trio, though, as the girls were able to rely less on Hennings and Owens and make an impact themselves, growing more and more as players. By their junior year, the five players were reunited on the varsity squad, and, this year, became Shoshone’s starting five. All that experience, all that time with one another, now comes together on the court more often than not. One thing that sticks out to Chapman, beyond the actual ability the girls have developed over the years, is the knowledge they have about the game. He said they’ll go to boys basketball games, or other girls contests, and react in disgust when they see teams make bad mistakes, ones they know better than to make themselves. They’ve stayed together, learned the game, and now have an opportunity to put one together one final run, a culmination of something that started as long as nine years ago. As juniors, although not all were starting, they helped the Indians to a district championship win over Oakley. However, at the state tournament, the Indians fell to Prairie in the semifinals, while that Oakley team defeated the Pirates in the title game, becoming state champions. There was a bit of a sting when that happened, the players agreed. But, Chapman said he believes his team is more concerned with defining their own legacy, and not worrying about the past. If anything, the players concluded that last year’s outcome, combined with the approaching end of their Shoshone careers, can be this season’s fuel. Shoshone enters the state tournament with a lone blemish on its record, cruising through the regular season and district tournament. The Indians have allowed 40 points in a game just twice, and 30 points only five times. They enter their first round contest against Liberty Charter on a 14-game win streak. But just about everything in the past goes out the window when play begins on Thursday. After every practice, the Indians say “state champs” before they break, reminding themselves of the goal they’ve “always wanted to reach,” Regalado said. Kerner called a potential state title “a dream come true,” while Fitzgerald said the fact that so few teams do get to call themselves state champions would make it all the more special. Every single one of the seniors has the same vision of what could end up happening if Shoshone can win its next three games. Hennings recalled watching her aunt, who played for Dietrich, make several state tournaments. She was inspired from the moment she saw it as a possibility in her future. After every practice, the Indians say “state champs” as they break. Now’s their time to get it done. Sitting in the Shoshone High School gym, she pointed at the piece of fabric hanging from the ceiling to commemorate the Indians’ 2005 state championship triumph.